Whether you are doing a custom fairing installation, building a vintage cafe racer or need some lights for an endurance racer, we've got you covered. Airtech offers a nice selection of headlights and taillights for your custom project. This compact light is awesome for applications where you do not have a lot of room but need a headlight with high & low beam. Great for vintage bikes where the stock 7" headlight is too large to fit into the nose surface of the fairing you want; you could fit it into a race fairing and remove it for track days or use for an endurance race setup. All steel construction including the reflector, 60/55W H4 bulb with standard 3-prong. Black powder coat. Two M8x20 bolts included. E-mark. Super bright single element H3 55 watt bulb has extremely broad and deep beam pattern. Glass lens with metal housing measures 4.25" wide x 1.875 tall x 2.5" deep. Adjustable metal bracket makes mounting in just about any custom application easy. Please note: sold individually. Price is for one light. This small sealed beam has 5K candle power low and 10K candlepower on high in a small 4 1/4" bulb. This means more intense light with better dispension and dept of field the original bulbs twice its size. Used in our endurance race fairings (like the FZR-R1 kit), and custom Buell bodywork. This universal headlight is the perfect size for many vintage fairing projects. It's compact size makes it easier to fit into the nose of some race fairings. All steel construction, black powder coated housing with a chrome trim ring. M10 threaded mounting points (no bolts included). Standard 60/55 H4 bulb. Clean and simple. Looks great tucked up underneath a street tracker tail, on the back of a cafe tail or take the lights off the license plate and french them in as shown on the Kawasaki below. 12V, dual filament bulbs, 3-wire. Cool oval taillight to tuck in underneath a cafe seat but will also mount directly onto a fender. Aluminum license plate bracket. 12V, dual filament bulb, 3-wire. Enhance the look of your brit bike or other custom application with this taillight assembly. Lens measures 4-1/4' wide by 2" high x 1-3/4 deep. Has license plate illumination on bottom. Mounts on flat surface with two studs on 3-3/8 centers. DOT OK. Cool shape, works wel for vintage applications where taillight is tucked in underneath the tail. Also used in our Ducati Supertwin Kit. 12 volt replaceble bulb, with license plate illumination on bottom. Measures 4-3/8" wide by 2-3/4" tall by 2-3/4" deep. Mounts on flat surface with two studs on 3-1/4 centers. DOT OK.
Can you say slick? This ultra slim taillight is only 1" tall and can be tucked in really tight underneath a bubble seat or rear frame hoop. 20-LED taillight/brake light (very bright! ), 5-LED license plate light. Taillight has built-in resistors so connects to your regular wiring harness. Clear lens, red LEDs. 20-LED taillight/brake light (very bright! ), 5-LED license plate light. Taillight has built-in resistors so connects to your regular wiring harness. Cool slim LED taillight to tuck in underneath a cafe seat or dirt track seat but will also mount directly onto a fender. Aluminum license plate bracket, red lens. Built in resistor board. License plate bracket: 6-3/4" x 1-7/8"
Samde as HLR12 but clear lens - LEDs light up red. Built in resistor board. These cool small bullet turn signals are much higher quality than the el cheapo plastic turn signals you see elsewhere. Very compact and clean looking. Heavy duty aluminum housing, single filament bulbs, amber lenses. Lens face 1-1/4", overall length 2-1/4", stalk length 3/4". 8mm mounting bolts. Same as TS1 with clear lens. These cool small bullet turn signals are much higher quality than the el cheapo plastic turn signals you see elsewhere. Very compact and clean looking. Heavy duty aluminum housing, single filament bulbs, clear lenses. This is a very clean looking license plate bracket that you can tuck up underneath a tail section and bolt to the frame or custom mounting point. The top part of the bracket is slotted which makes this bracket very flexible in application as it allows mounting bolts to be between anywhere from .75 to 4.75" apart. Slots and holes for 1/4" / 6mm fasteners. Steel bracket, black powder coat. This is the same licens plate bracket with two turn signal mounts. Clean looking license plate bracket that you can tuck up underneath a tail section and bolt to the frame or custom mounting point. The top part of the bracket is slotted which makes this bracket very flexible in application as it allows mounting bolts to be between anywhere from .75 to 4.75" apart. Slots and holes for 1/4" / 6mm fasteners. Turn signal mount holes are for 3/8" / 8mm bolt. Shown here with our sleek aluminum bullet turn signals TS1 (not included). Finally a simple, clean switch that does not look out of place on a vintage bike, will work as a kill switch, headlight switch or anywhere a positive on/off switch is required. Also great for custom builds, drag bikes, race bikes etc. 2-wire, for 7/8" bar. The switch housing is only 7/8" wide so narrow enough to fit between a push-pull race throttle and the brake lever. 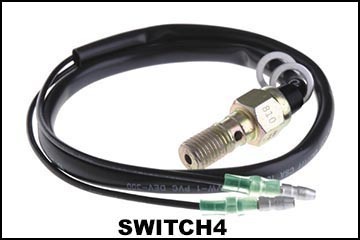 Please note: If you are not qualified to install this switch yourself, please have a licensed mechanic install it, to avoid damaging your bike's electrical system or worse, yourself. Airtech can not be held responsible for any damages resulting from improper installation. Simple, clean switch that combines kill switch (on/off) and starter button (momentary). Also great for custom builds, drag bikes, race bikes, track bikes etc. Fits 7/8" bars. The switch housing is only 7/8" wide so narrow enough to fit between a push-pull race throttle and the brake master cylinder. Fits most Japanese bikes. Replace original banjo bolt with this switched one to retain brake light switch function. Coarse thread 1.25 pitch. Fits most European bikes. Replace original banjo bolt with this switched one to retain brake light switch function. Fine thread 1.00 pitch. These rubber mounted brackets are made of aluminum with a chrome steel clamp and look great on vintage cafe racers or you can use them to replace the rusted stock headlight brackets. On cafe racers these brackets are also cool because they will allow you to drop the headlight down lower so you can lower your gauges. You will absolutely need a set of these to replace the stock headlight ears when installing clip ons on your vintage bike. Also available in 31mm HLB31 and 38mm HLB38. Clockwise from upper left HLB1. For our HL3 and GSXR fender lights, top right H4 bulb (no longer available), lower right HLB2-130 watt H3 bulb for our HL4 lights.